Fathoms deep. Jean sees visions of his Juliette in the grim waters of the canal in Jean Vigo’s L’Atalante, a fantastical story of romance and high emotion grounded in the realities of everyday life. S. – What a treat it was to see this film on the big screen at the Astor. The opening scenes involving the quite frightening Pere Jules (Michel Simon) roughly marching the cabin boy through town had me a little confused, until their mission of providing a floral tribute to the bride as she boarded her new home became apparent. But from the first I was captivated by every moment Juliette (Dita Parlo) was on screen. You spend a bit of time catching up to the story in this film. Quite often the importance of what has just played out isn’t clear until the scene ends and you are abruptly cast into another just as the fog lifts. This rather awkward description may make the movie sound clumsy or baffling, but the opposite is true. You are in safe hands with Vigo, who infuses suspense, charm and passion to what is essentially a simple tale. I loved this film and it has rarely been far from my thoughts over the past few days. J. – It certainly keeps popping up in my mind as well, and climbing the ladder of my “Top 10… As Of Yet” list every time I give it a good ponder. I agree that it is a simple tale and one that could easily be accused of undue sentimentality, but I think it is wonderfully layered. It really reminded me of Sunrise, or rather what Sunrise could have been if it had told its story well. In Sunrise, F.W. Murnau spent a fortune to create an unreal reality for his simple fantasy to take place in; Vigo went the other way and reveled in the real, finding the fantasy in bits of trash and grime or scenes of industry. 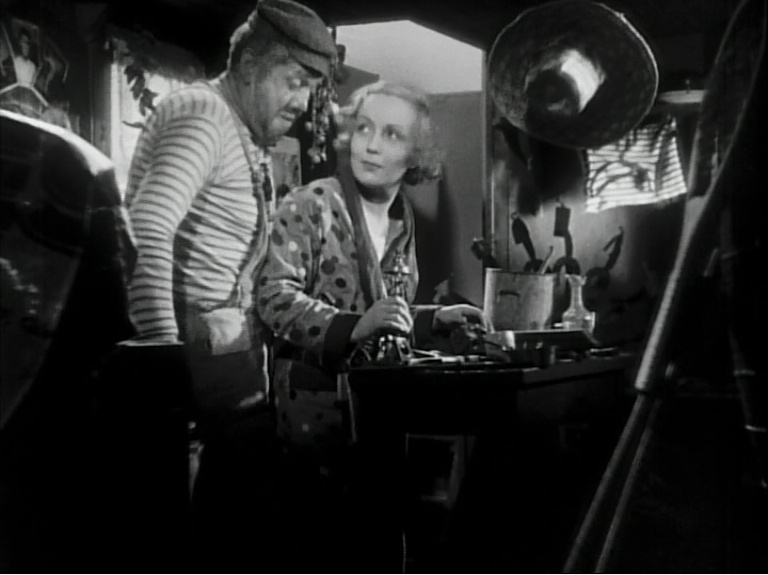 There were a few hints for me early on that L’Atalante was going to be a great movie, but I think it really started coming together for me during Juliette’s tentative steps atop the black hull of the ship while still in her wedding dress. The strange juxtaposition of the white-clad, almost spectral bride on the inky canal was marvelous and smacked of the unreal. The film really found an excellent balance throughout between down-and-dirty reality and a heightened, emotional feel. While there is a story of sorts, it is a movie driven more by feelings than plotting. Juliette, still in her wedding dress, walks along the top of the barge that is to be her home. 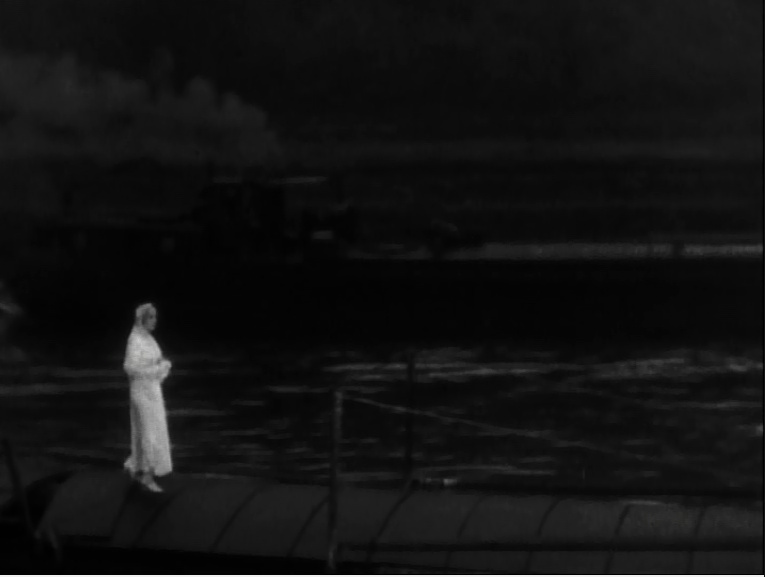 The ghostly, unexpected sight of the white-clad woman amid the dark utilitarian workings of the canal illustrates the movie’s uncanny ability to make visual poetry of the mundane. S. – Juliette tentatively walking up that cold dark aisle was a jarring vision of romance and reality. She is so obviously out of place on the barge but her presence is like an enchantment; now that you have seen it, reverting back the ordinary would be unbearable. Despite the main theme being the newlyweds I think the movie manages to avoid becoming sappy because the characters are so complex. Each of the vignettes reveals elements of personality, shunning the tired stereotypes that make so many romances dull. I adore the scene where Juliette, while tackling the laundry, mentions (very matter-of-factly) to Jean (Jean Dasté) that you can see your lover’s face when you immerse your head in water. He makes fun of her belief by goofing around, she is bemused by his antics but calmly explains that she saw Jean before she met him and he will see for himself when he tries it properly. You know Juliette’s claim is absurd but you want to believe her. Her very presence on the barge opens up this kind of possibility. Vigo wasn’t afraid to let his camera in close and to let his actors behave more like real people. There is nothing mannered about the romance in L’Atalante, the emotions and passions are powerfully felt both in moments of joy and despondency. J. – You absolutely do want to believe her. And I’m sure we’ll get back to how right she is a bit later [hints at standout scene]. I also think you rightly describe the movie in terms of vignettes. The film certainly does have an overall story and arc to it, but it is broken up into small scenes that almost exist as independent units. Scenes end a few beats before you assume they would which can be quite disorienting. And when a new scene begins it is often impossible to tell how much time has passed between it and the preceding scene — it could be hours, it could be weeks. But I think you were right above to say that it isn’t “clumsy or baffling”. It simply adds to the fantastical feel of the movie, and forces you to just let the movie wash over you. 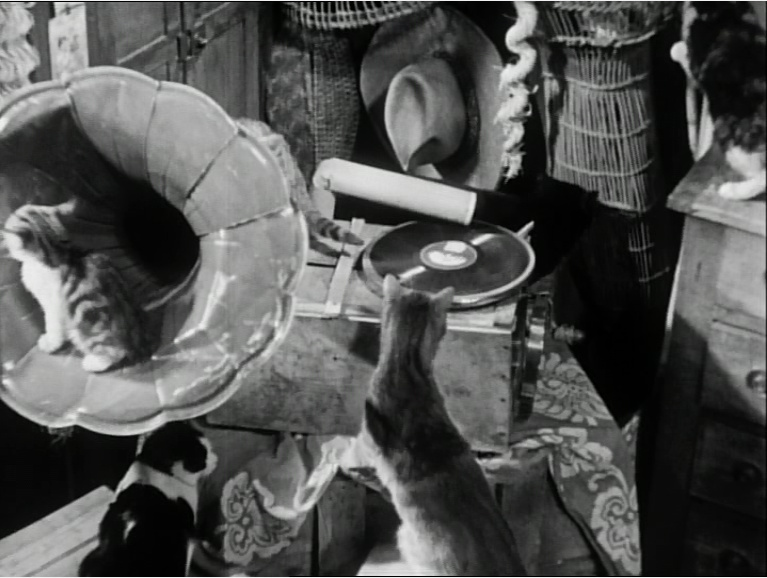 When we were at the theater I semi-jokingly remarked that L’Atalante is the first Wes Anderson movie, and I stand by that flippant comment. It is packed with quirky characters in a carefully crafted dollhouse dream of a film (albeit with quite a bit more grit), and the movie revolves less on plot than it does on the relationships between the characters. Heck, the nearly mute, idiotic cabin boy even prefigures a stock minor character in the Wes Anderson universe (see, Dudley). Now, I love Anderson’s movies but, and this is an important but, L’Atalante is much more emotionally powerful and satisfying. Romance and lust are also twee elements in most Anderson films, but the passion between Jean and Juliette is visceral, raw, almost violent, and surprisingly frank for a movie from the early 1930s. S. – A real strength of the film is that you are let in to so many parts of their characters. Love is the fundamental bond between Jean and Juliette but it is not a single emotion; there is playfulness and affection but also friction, frustration and desire. The timeless and complex issue of respecting personal freedom within a relationship is explored. Jean’s impulse to control Juliette, who is compelled to go out into the city and discover Paris, is borne out of jealousy and fear of losing her. His rash decision to pre-empt his (imagined) betrayal and abandon Juliette does hurt her, but also paralyses himself in the deep gulf of her absence. Jean’s anguished plunge into the canal allows him to see his beloved again in a scene that is ethereal and deeply touching. J. – That scene is remarkable, in no small part because it really should be mawkish and obvious but manages to feel heartfelt and cinematic (in the best sense of the word). The movie may have a short running time and a simple story, but it definitely earns its emotional payoffs without ever feeling manipulative. And I think you are exactly right in attributing that to the access we are given to such multidimensional characters. I’m sure that is partly due to the contained environment of the boat. The characters have little choice but to reveal themselves when pressed together like that, in part because of the interactions between the players, but also because the built up detritus of their lives is stuffed into those rooms and lovingly framed by Vigo. Pere Jules is an excellent example of that. He initially comes off as a buffoonish lout — mere comedic relief — but he’s not allowed to inhabit just one niche. There is the wonderful scene in which Juliette is given a tour of Jules’ cabin on the ship. The room is packed full of mementos of a life lived on the high seas and in foreign ports of call. It gives him so much depth and gets to the core of his clownish persona, while also revealing a tremendous amount about Juliette in the process. It’s a scene that manages to be playful and silly but also vaguely menacing. And Jean’s reaction to Juliette hanging out in the first mate’s room is raw fury, which explosively sets the stage for his character arc. Overstuffed sets (such as Jules’ room) give extra life and character to the performances by the actors and highlight the close proximity in which they live. They also mean that the characters have no choice but get involved in each other’s lives. S. – The way the film is shot adds atmosphere to so many of the scenes. Inside the barge the camera is often positioned high above the action (maybe out of necessity), sometimes pointing directly down onto the scene, clearly displaying the cramped stage inhabited by these big personalities. Sometimes there barely seems enough space for them all to breathe, it is no wonder that this volatile atmosphere explodes every so often. One of the aspects I found curious early on was Pere Jules seeming quite open to accepting Jean’s wife into their confined, masculine world. There is the odd grumble here and there but on the whole he takes the change in stride and is also the one who takes action to reunite the newlyweds when he realises the depths of the skipper’s despair. I guess the clue lies in the scene you described where the first mate reveals a rich history of past experiences with the tour of his cabin. This is a man who has learnt what is valuable. L’Atalante is just that kind of film, it gives you more than you realise and inhabits your thoughts long after the credits roll. Vigo has a penchant for extreme camera angles, including this shot which looks directly down on a room in the ship from the ceiling. His unorthodox approach really helps generate a fantastical feeling and keeps the audience every so slightly off balance. J. – I don’t think Jules accepts the situation so much as he is resigned to it and willing to drink himself stupid if he’s having a bad day. But you are correct that he is the only one among the characters with the sense to take action and to not let pride or emotional turmoil lead to paralysis. Or maybe its just that he’s too eccentric or well-traveled to care about such things. I love the way this movie is shot. 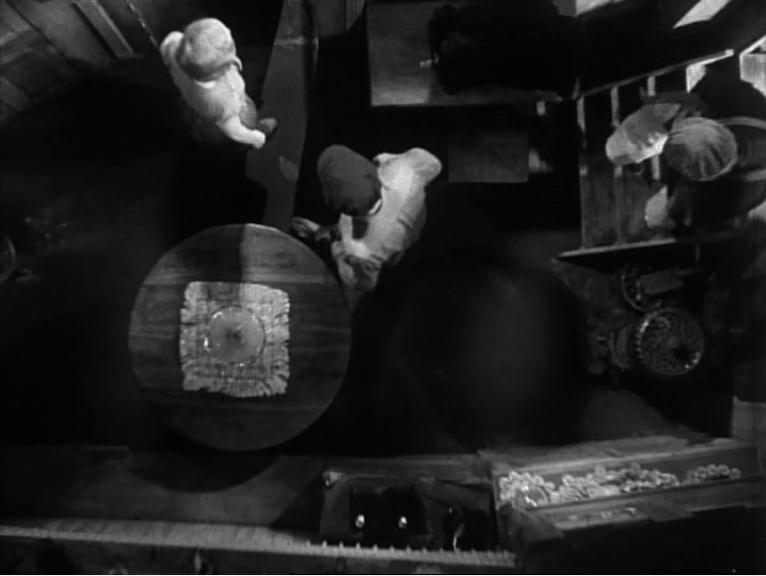 The framing of pretty much every shot is excellent and the unusual camera angles and overstuffed foregrounds really do wonders in setting the scene aboard the L’Atalante. But even more so I enjoyed the way Vigo framed location shots in such a way to make some very industrial, unpleasant places look absolutely magical. (I’m sure being in black-and-white goes a long way to achieving that as well.) I also liked how the camera often becomes rather actively involved with the actors. There are a number of shots and scenes that end with the characters pretty much bumping straight into the camera (intentionally), which breaks the fourth wall in a very unorthodox way. There was one last thing I was hoping you might talk about in this yammer, S. This is a very sentimental film and one that does have a joyful ending, but you mentioned after we watched it that one thing that impressed you was that you got the sense it doesn’t necessarily have a happy ending. This isn’t a movie where it feels like the bliss is going to last, which I think is highlighted by the final shot zooming over the boat into unknown waters. S. – Perhaps this is what I liked about it most of all. Despite the depth of feeling they share the moment where Juliette and Jean are reunited begins with a hesitation. Can they get past the wrongs they have done one another? This experience has hurt them both, can they continue to risk the potential for anguish against the chance of happiness? Rather than the standard “happily ever after” finale we get their braver, and far more powerful, decision to trust in each other as together they face what lies ahead. 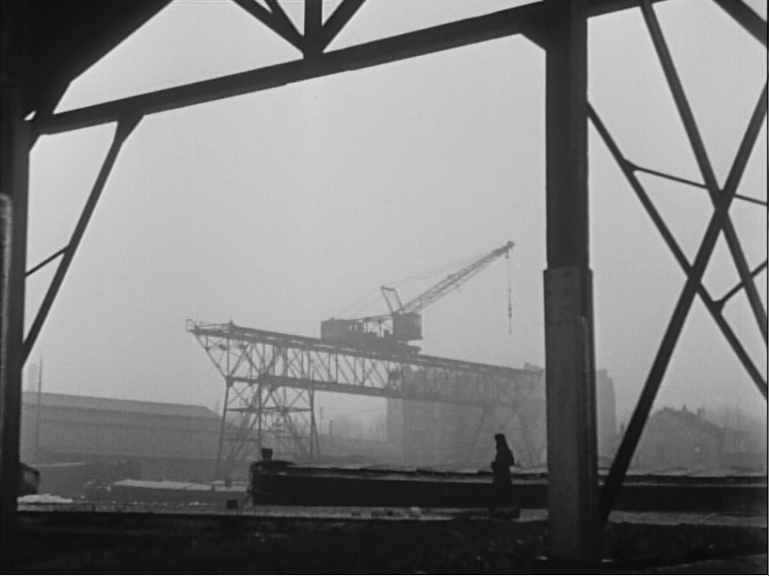 Pretty much every frame of L’Atalante could make for a yammer-worthy screen grab, but this shot of the abandoned Juliette wandering through the docks is a great example of Vigo’s ability to create beautiful compositions while shooting in decidedly unglamorous locations. Although perhaps this has something to do with the film’s cinematographer being Boris Kaufman, brother of Dziga Vertov, the director of the Man With a Movie Camera — a film that really knew how to show off industrial settings. We didn’t really mention the cats… So yeah, there are lots and lots of cats aboard the ship. Told you it was quirky.